Meristem are delighted to announce that we will be designing and building a 32m x 3m living wall for the Savills and David Harber Garden at the RHS Chelsea Flower Show 2019! Award-winning international artist, David Harber, is sponsoring the show garden, along with co-sponsors Savills and will created by garden designer Andrew Duff MSGD. Andrew Duff has designed the garden in celebration of the environmental benefit and beauty of trees, plants and grass in urban spaces. The design seeks to create a beautiful, sustainable woodland clearing in a city garden. As our mission statement is 'Turning the Urban Grey Green', this is the perfect fit! Using predominantly native planting, Andrew Duff’s design features roughly 1000 perennial plants, under planting 18 mature trees. 30 square metres of woodland edge meadow turf will be interplanted with 10,000 bi-annual species, filling the remaining space. Our living wall will have an additional 3,000 species creating the perfect backdrop to the garden. A key feature of the garden is a central pool of water with David Harber's 3.5m sculpture, which is inspired by the surrounding woodland setting and falling leaves. 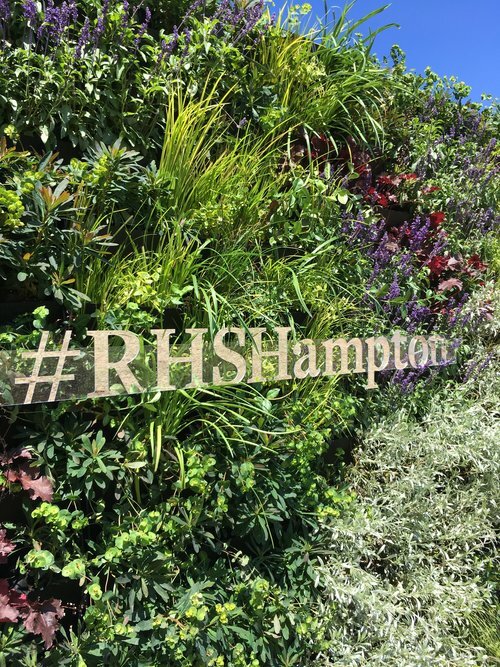 As you may have read in previous posts we have supplied numerous living walls to the RHS, the latest being 4 living walls for the Hampton Court Flower Show 2018. Contact us for more information, we hope to see you at the show in May!